Some of you are happy with invoices being plain and simple. But there are also those who like to have a few more options. So here’s a guide to every data field you can add to a QuickBooks Online invoice, so you can customise it best for what your business needs! 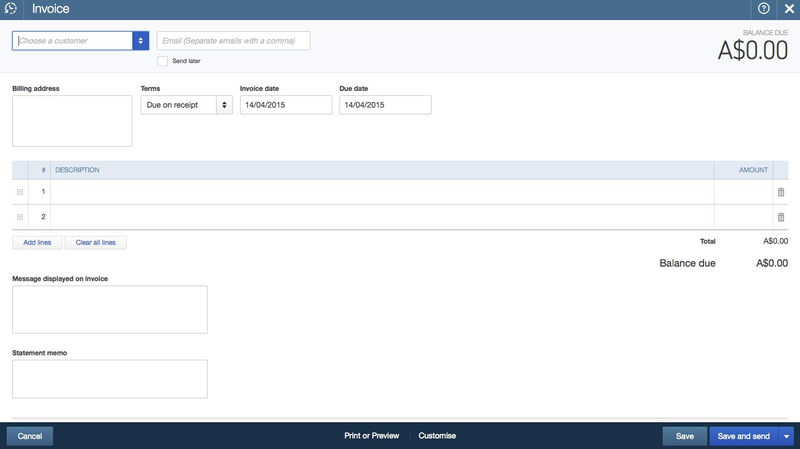 To bring up the invoice form, click Create (+) > Invoice. Why use it: To enter your own transaction numbers. If you turn this off, QuickBooks Online automatically numbers the transactions. 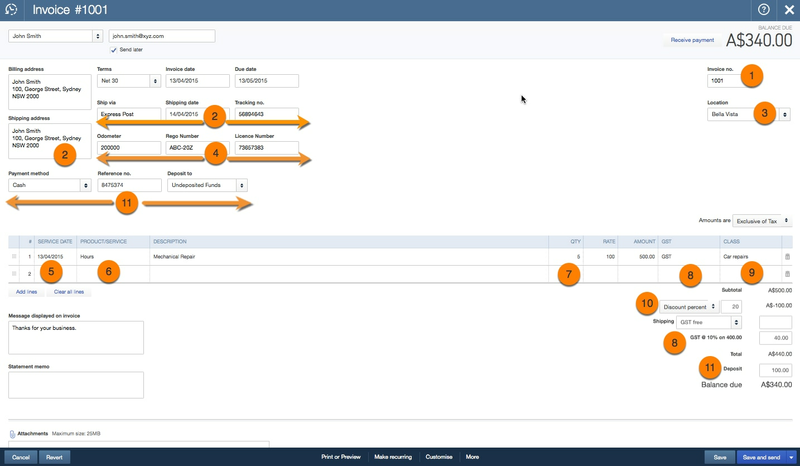 Example: If you use classes to track departments/divisions, you can have retail invoices R1, R2, etc. and wholesale invoices W1, W2, etc. QuickBooks Online conveniently keeps the letter (based on the last invoice) and increments the number automatically for you! How to set it: Gear > Company Settings > Sales > Custom transaction numbers. Why use it: To track a separate shipping address, method, date, tracking number, and amount. How to set it: Gear > Company Settings > Sales > Shipping. Related setting: Gear > Advanced > Chart of accounts > Shipping account. Why use it: To assign transactions to different physical locations. Examples: Stores, sales regions, counties, properties. How to set it: Gear > Company Settings > Company > Track locations. More info: You can filter A/R reports to see who owes you in just one location. Why use it: To include any other information you want to track. Examples: Sales rep, assistant, driver, preferred delivery date, contractor’s license number. How to set it: Gear > Company Settings > Sales > Custom fields. Why use it: To track the date a service was performed separately from the invoice date. How to set it: Gear > Company Settings > Sales > Service date. More info: QuickBooks Online autofills this date from timesheets. This is a huge timesaver if you need this! Why use it: To include an item from your Products and Services list. How to set it: Gear > Company Settings > Sales > Show Product/Service column on sales forms. Why use it: If you sell product and/or services and want to track quantity/rate information. How to set it: Gear > Company Settings > Sales > Track quantity and price/rate. Why use it: If you are registered to pay GST. How to set it: Left navbar > GST > Set-up GST. More info: In the GST section Add New Tax option enables adding custom taxes relevant to your industry. Why use it: To assign transactions to different segments. Examples: Departments, product lines, enterprises, properties, manufacturers, partners. How to set it: Gear > Company Settings > Company > Track classes. Why use it: To track discount rates (either a value or percent), if you use them. How to set it: Gear > Company Settings > Sales > Discount. Related setting: Gear > Advanced > Chart of accounts > Discount account. More info: Click to choose whether to apply tax or discount first. Why use it: To subtract a customer deposit from the total to calculate the balance due. How to set it: Gear > Company Settings > Sales > Deposit. More info: When you enter an amount in the Deposit field and tab out, the three other fields appear. Available in QuickBooks Online Plus only. Available in QuickBooks Online Plus and QuickBooks Online Essentials only. Invoice settings apply (automatically! a good thing!) to estimates and sales receipts as well.